I've been hunting West Sparta for over 34 years. The year my father and I got permission the farmer Clarence Sarle he was 63 years of age. Through out our frendship and hunting seasons we created quite a friendship. Bob Brady a neighbor back home, and a great guy, started hunting with us over 25 years ago and also created a bond with Clarence. Five years ago Bob and his son John, who is quite the hunter himself, asked Clarence if they could purchase the property... and they did. This was a dream come true for me because the property that I started hunting on, and my son started hunting on, will always be there. Well lets get to the 2011 season. We bow hunted a lot this year we had good trail cam pictures of some excellent bucks... one in paticular had kickers of his G2's. John, who is known by all of us as "J.B.", hunted during the rut and one morning had a shot at a 125 class 9-point, but let him go because of what he caught glimpse of walking behind. JB saw a giant chasing a doe, but it never presented a shot. This story for me begins on opening day of gun season. I was sitting low on the land in a stand by a thicket when at first light I caught glimpse of a doe walking through. I started videoing hunts five years ago... so when the doe was coming in on went the video camera. After she passed I was looking down the hill, which was a BIG MISTAKE on my part because behind the doe was a descent buck that I never saw until it was to late. I grunted, stopping him to get a shot off with my 7m-08 pistol, but the miss was a lesson learned. After four hours of sitting I heard off to my left on the neighbors property a roar that was preceeded by the biggest 8-point I've ever seen in all my years of hunting here. The 8-point was trying to mate a doe and keep the other two smaller bucks away. He roared for 10 minutes, this was a show I'll never forget. At one point I had the pistol on him ready to shoot, but my brain kicked in and I couldn't shoot because it was on posted property next door. During the mid point of the season our friend Clarence past away. He was a great person and Bob and I were proud to be pall-bearers. Moving the clock forward, it was the last Sunday of gun. It was cold... 13 degree's... Bob and I were hunting low near the thickets. After three hours Bob was going to walk the property line and I was going to the center of the proprty for a little drive. I was only set up for ten minutes when to my suprise there were two bucks heading my direction, one being the buck I let go on opening day. Waiting for what seemed like forever the giant 8-point presented a broadside shot and the encore 7m-08 connected. I'll never forget this year... 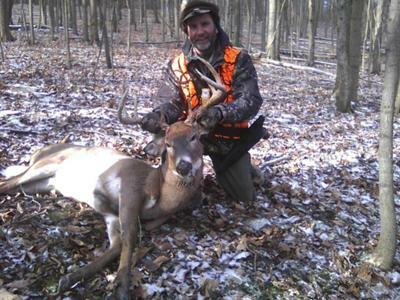 I shot the biggest 8-point I've seen there with my hunting buddy Bob. But, most of all, the memories of a great guy and friend... who, by the way, was 97 years of age. Thank you Clarence I know you were there that day too.